Original KISS guitarist Ace Frehley was interviewed on this past Friday night's (November 1) edition of Eddie Trunk's "Eddie Trunk Rocks" radio show on New York's Q104.3 FM. A few excerpts from the chat follow below (as transcribed by BLABBERMOUTH.NET). Frehley: "I'm happy that I'm gonna be inducted — most likely — next year, in April, in New York City, and it should be a great event. There's no way [KISS bassist/vocalist] Gene [Simmons] can put a lid on it. I mean, what's he gonna do?" Frehley: "I don't know what's up with Gene. He used to say to me in the '70s, every time I did something stupid, he'd go, 'Ace, you're shooting yourself in the foot again.' Well, he's been shooting himself in the foot for years. "Gene's living in the past. He's become a caricature of himself. I mean, from the very beginning, his only motivation was money. The guy has no friends; he's not respected by his peers; he's pissed off thousands of fans; he's never had a hit single, like I've had. I had the most successful Gibson signature-series guitar in history. He didn't. It goes on and on. He took the safe route: he never got loaded, he never partied. I took the same route Elvis Presley took and [Jimi] Hendrix and Keith Richards and Jim Morrison… it's endless. I have all this life experience and thank God I can live to talk about it. What's he gonna talk about? All he can do is badmouth other people." Frehley: "I don't know. I found it very weird that, instead of getting a call from Gene or [KISS manager] Doc McGhee or [KISS guitarist/vocalist] Paul [Stanley], because they're behind this documentary, instead of getting a call from them, I get a call from my bodyguard, and he got a call from KISS' bodyguard about me doing an interview for this documentary. They tried to go through the back door — probably because they don't wanna pay me any money, as usual, and it left a bad taste in my mouth, and I just passed on it. You want me to do a documentary? Let me know how much money you're making, give me my fair share, and I'll sit down and talk. You don't wanna do it that way? Forget about it… If KISS is behind the documentary, Paul and Gene are making the lion's share of the funds." 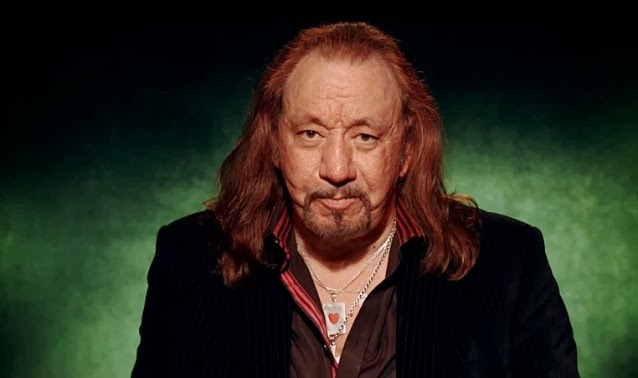 Frehley: "I left the house over two and a half years ago. My attorney is taking care of it. It's not in foreclosure. Things got blown out of propotion. Somebody didn't take care of what they were supposed to do. And my attorney is taking care of it. But, basically, I'm out in California now, and I have people living on that property, taking care of it, and they've been showing it to people who are interested in possibly purchasing it. And the whole thing was kind of a misunderstanding." Frehley: "I've lived in New York my whole life. A lot of people used to come out to California and say, 'Hey, what are you doing? You are a traitor.' But since I've been out here, I don’t see myself coming back. I like the climate. I couldn't do the winters anymore. Once you hit 60, it's, like, get me outta here."